Property 26: Pula: APARTMENT SANDRA - YOUR PLACE TO STAY! 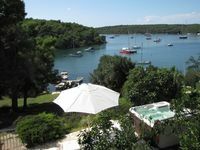 Property 49: Directly on the sea, fantastic view, near Pula, garden and whirlpool. I can't rave enough about this rental. Our host Isabel was an absolute delight that went above and beyond in really making our vacation a dream vacation. She helped arrange our visits to outstanding local restaurants and wineries and even helped get us taxi's to the wineries. As for the accommodations they were pristine, clean, everything was super comfortable, the beds, pillows, bedding all super comfy. A huge smart tv with a very comfortable couch and dining area. The kitchen had absolutely everything you would need to cook a full meal if you weren't eating out. The views were amazing from the deck. The hot tub was super relaxing. The garden was beautiful and even the fruit from the trees was delicious. I can't say enough good things about these accommodations and our host really made our trip a dream trip.